The Neptune Class was designed to be the ultimate munition-carrying machine. Development took place in a secret base on Triton, where the prototype designers worked with United Star Fighters Incorporated to get their ship built up, beefed up, and ready for production. First and foremost, weapons: The Neptune has them all. It also has plenty of armor, defensive shielding, and computer equipment on board as well, since it needs to keep all the extra goodies working fine. Of course, it also needs a power source for everything. Powering the Neptune are its four megasized engines, which serve the role of lugging this gun-covered lump through space. The Neptune has a maximum speed of Warp factor 6. Meanwhile, it has a turning radius comparable to that of a small planet. Remember what I said earlier about too many weapons: forget it. THAT MOC didn't have too many weapons, THIS ONE does... that's just crazy.... WAAAAAAAAY too many guns.... WAAAAAAY too many rockets... WAAAAAAAAAAAAAAAY to many weapons. Next, the first test wouldn't be a live one, it'd be on a holodeck, running a simulation. Next, the physical controls: WAAAAAY too complicated. The computer could handle that easily. (We're already doing it on modern fighters) so there is simply no need to put another person in danger by using two seats. That out of the way: The fighter looks pretty cool underneath all those weapons. Vardok (dino) S'ren wrote: Remember what I said earlier about too many weapons: forget it. THAT MOC didn't have too many weapons, THIS ONE does... that's just crazy.... WAAAAAAAAY too many guns.... WAAAAAAY too many rockets... WAAAAAAAAAAAAAAAY to many weapons. One of its roles is as an attack fighter.... it's supposed to have lots of weapons, and even then, it's not like they're always going to be firing at the same time all the time because they do take up a lot of power. They only do that when attacking large ships in a fleet battle, and even then, they only do an attack like this once before returning to base. 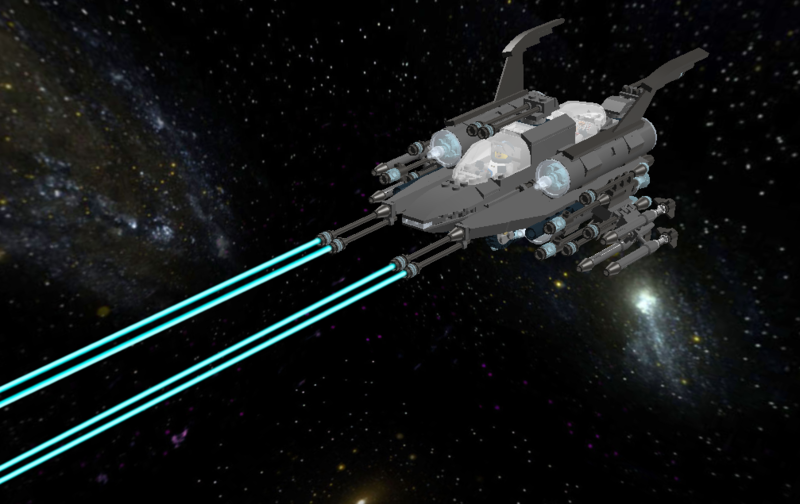 Seriously, I think having a lot of weapons on a star fighter is actually very practical, for a star fighter. It's in space, so aerodynamics mean nothing. Next, power. Remember, energy weapons can be switched on and off. When they're on, they use power, but when they're off, they don't. It's not practical to keep all the weapons online and firing all the time, which is why they aren't. I like building multipurpose fighters, which includes doing things like attacking big ships and dogfighting with small ones. A fighter like this can do both. Lastly, yes, I also acknowledge that a fighter like this is very expensive. That's the only reason why I also have purpose-built fighters like the Star Hawk (interceptor) and the Star Phoenix (dog fighter). When I think up the shape of a fighter, I think of everything, engines, wings, central hull, and weapons. The weapons are a core part of a fighter's shape, at least to me. But seeing how nobody here likes the practicality of having weapons, I guess that means I just don't share the same building style as all you guys here. There's nothing wrong with that, though. Constructive criticism is always welcome, the only problem is, I can't use it. All of the ships I've posted are old and I can't change them. 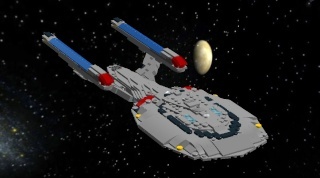 Even if I did build new starships and fighters that make use of constructive criticism, I don't know where I would host their LDD files to share them. Ahem, correction dino. Waaaaay too many guns, there is no such thing as too many rockets. Because having a thousand rockets is like having a thousand rounds of ammo....which in a dog-fight is.....not much at all. I cuold quite easily, and quickly, dump a thousand rockets into a small handful of cruisers. But I usually solve this problem by creating rocket pods instead of showing each rocket. Actually, you know you have too many rockets when you're fighter is too heavy to take off. Aside from that... you're good to go. Point taken, and agreed, lots of rockets is good. Well with engines nowadays, it's a sad thing when you can't take off due to your rocket load, I think rather your engines didn't start up. This is the 26th-or-so century, so rockets can replicate. Can't they? Ehh......well first off, I never really like the whole replicate idea. It seemed liek the biggest sci-fi cheat every. It's like spawning all teh goodies at your feet with an admin hack, it's just dumb and ruins teh game. But that aside, I don't think a fighter liek this has any more than an emergancy food replicator, and give teh amount of energy needed to make the smallest amount of mass, and then force that mass together the way you need it, and that quickly, you need a flipping ton of energy. A galaxy size starship I can (maybe) see doing that....a fighter.......ehh....NO. But that's liek saying the makers of star-trek where realistic or something. But even if it was feasible, why do ships still need to restock on diterium every so many years? Then again, replicated food is just rearranged protein molecules with food coloring. well if you're jsut beaming protein mollecules around, then taht takes away the create problem, now you're stuck with quickly and arrange...wait...when that guy orders a bowl of tomato soup in voyager, does taht mean the bowl is edible to?!? So you have to keep it stocked with enough protein......so you still need the same mass....just compressed super small.......hmmm........only slightly more feasible. And then there's teh whole thing of beaming things around, that's rather impracticle too, and also cheap. It takes all the fun out of tactical insertions. That's why Star Wars didn't have it, so they could steal old imperial shuttles to the forest moon of endor.....no to mention swoop down the entire clone army onto geonosis. Beaming down just isn't near as fun.